Does cybersecurity concern you? Would you like to know how to make your business safe? Are you worried about data security breaches, but you do not know where to start? Over 94% of data breaches involve small and medium-sized businesses (WFLA). These breaches often prove catastrophic to business owners but are just too “minor” to ever appear in national headlines. The good news for business owners, entrepreneurs, or just those interested in cybersecurity in the extended Greensboro, NC area, a special “Cybersecurity Panel Discussion,” is scheduled for April 11th. The expert panel will discuss with attendees, cybersecurity, including common risk scenarios and how to respond in the event of a data breach. The panel will take a realistic look at cybercrime and how businesses can and should protect themselves. Targeted specifically toward small to medium businesses, attendees will receive practical tips and guidelines on how to secure their data without damaging their bottom line. Utesch, who has over three decades of experience in the field will be part of the panel discussion, along with FBI Special Agent Adam Scholtz, Certified Ethical Hacker, Garrett Baltezegar, and HIPAA Privacy and Security expert Karen McKeithen Schaede, Attorney, Connors Morgan, PLLC. This combination of in-depth knowledge and experience from the cybersecurity, IT services world is quite balanced and is sure to deliver attendees a great deal of value. 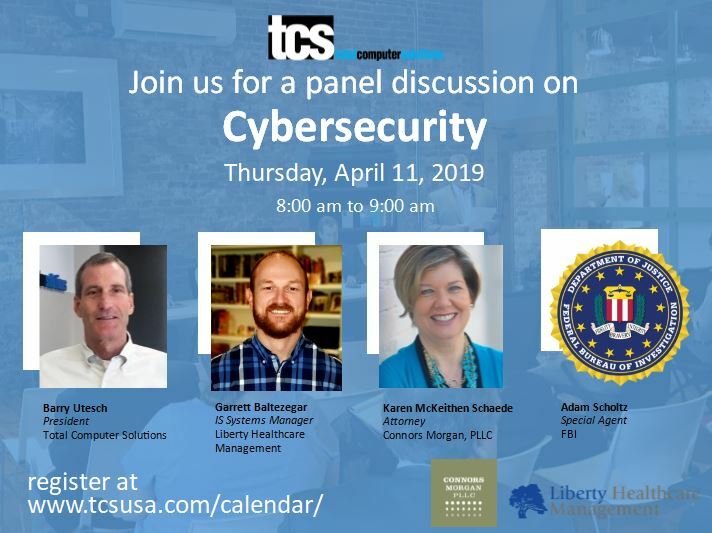 The “Cybersecurity Panel Discussion” will take place in the Revolution Mill Gallery Room, 1250 Revolution Mill Drive Suite 123, Greensboro, NC 27405, on Thursday, April 11th, 2019 from 8:00 AM – 9:00 AM. The panel discussion is free, but registration is required. Register for tickets to this event at www.tcsusa.com/calendar/. If you have any questions, please call 336.804.8449. For more information be sure to visit www.tcsusa.com and the event’s Event page at https://www.eventbrite.com/e/cybersecurity-panel-discussion-tickets-54663739717.